As far as getting ready to take these, they were straightforward to prepare for. One gotcha is to make sure that you get test prep materials for the latest version of these, the “2009 Objectives”. There are still a lot of preparation materials out there for the old “2006 Objectives” which are deprecated now. I used David L. Prowse’s “CompTIA A+ Exam Cram, Fourth Edition”, ISBN-13: 978-0789747921. This was a good refresher on basic computer maintenance skills. If you’ve been doing computers for a while like I have, it’s a fast read. I went through the whole book in a weekend. I bought Kaplan SelfTests for 220-701: CompTIA A+ Essentials and 220-701: CompTIA A+ Practical Application. I took both exams at least once a day for a month or so, like 30 times. Each exam is 100 questions, and you get 90 minutes for each. The actual questions are very much like the book, and very much like the practice exams. There was perhaps a couple of questions I need to think about, but in general I blasted through each exam as fast as I could click the answers. Even with completely reviewing my work at least once, I completed each test in less than 30 minutes. 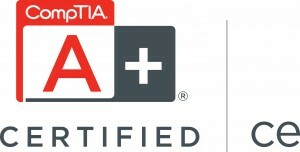 Next up: CompTIA Security+. I expect this to be a bit harder. The Security one *is* a bit harder…a lot of acronyms to remember and a lot more theoretical “situations” on that exam. But it is certainly doable! Is there any point taking the old 2003 exams and then upgrade by taking 2008 / 2012 exams, or is it easier just to jump straight on 2008 / 2012?